Betwixt Denver and Boulder, Broomfield services professional businessmen with large-scale hotels, sprawling malls, and multiple eateries. 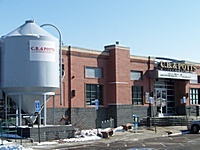 CB & POTTS, one of four state chains, consumed huge freestanding red-gray-bricked high-ceilinged sports bar sojourned August ’07. Copious liquor-lavished left-hand bar, glass-encased brew tanks, and open kitchen served large lounge area, opposing family friendly dining space, and corner billiard room. Continental cuisine went well with red-fruited orange-burnt tea-like Buttface Amber, lemon-bruised vegetal-soured Colorado Blonde, mandarin orange-soured banana-bruised lemon-soured coriander-clove-spiced solvent-finishing Big Horn Hefeweizen, and perfume-hopped wood-tinged grapefruit-embittered apple-apricot-orange-sweetened Big Red IPA. Spice-hopped citron-trickled 71 Pale Ale got bland while softly coffee-espresso-dried walnut-dabbed Cask Porter and resigned coffee-influenced black cherry-clipped Total Disorder Porter were a tad washed out.